Nylon Brushes The term nylon brush encompasses the wide spectrum of brushes made using nylon filament. Nylon brushes work well in a broad range of applications such as aggressive scrubbing, dusting, surface finishing, weld blending, rough surface preparation, cleaning and removing contaminants. The polymer properties give nylon brushes superior abrasion resistance, high heat tolerance, great chemical resistance and bend recovery. Nylon is one of the most commonly used polymers in brushes. The stiffness of a nylon brush is directly related to bristle diameter, length and grade. Nylon, depending on the grade, is more costly than lower grade polymers; however, the advantages justify the higher price. Some of the many advantages of nylon include low to moderate water absorption, an excellent fatigue life and the ability to work in both dry and wet environments. For industries such as semiconductor, aerospace, medical, food processing, automotive, commercial, industrial, textiles and electronics, nylon brushes are vital components in many processes due to extensive application-specific configurations. There are also a variety of colors of nylon filament, which is available in its natural milky clear color, or in dyed colors such as black or yellow. As the most widely used filament in brushes, nylon is used in brushes including cleaning brushes, power brushes, spiral brushes, strip brushes and artist brushes. Cleaning brushes such as bottle brushes are a vital component of industrial manufacturing processes that involve cleaning and can come in various sizes, depending on the application. Power brushes such as circular-shaped wheel brushes are used to deburr parts during initial phases of the surface finishing process. Spiral brushes mainly refers to twisted-in wire brushes, although it may also refer to a number of other circular or cylindrical-type brushes used in commercial and industrial manufacturing. 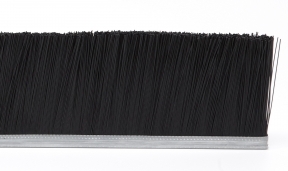 Strip brushes are long, thin brushes used for a variety of conveyor product cleaning, sealing and surfacing applications. 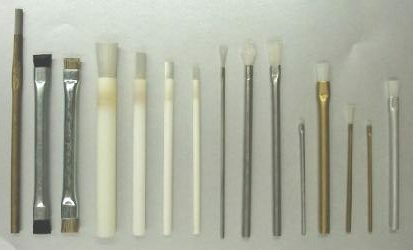 Artist brushes are high quality brushes that serve a variety of artistic and industrial applications. While there are many different grades of nylon used in brushes, specialty types of nylon are also used. An example of specialty nylon would be abrasive nylon. Abrasive nylon is impregnated with grains of materials such as silicon carbide, diamond and aluminum oxide for increased abrasiveness. Abrasive nylon brushes are typically used in applications such as deburring and cutting. Another type of specialty nylon would be conductive nylon, which is often used in static elimination applications, which are vital to maintaining static-free environments in clean rooms.